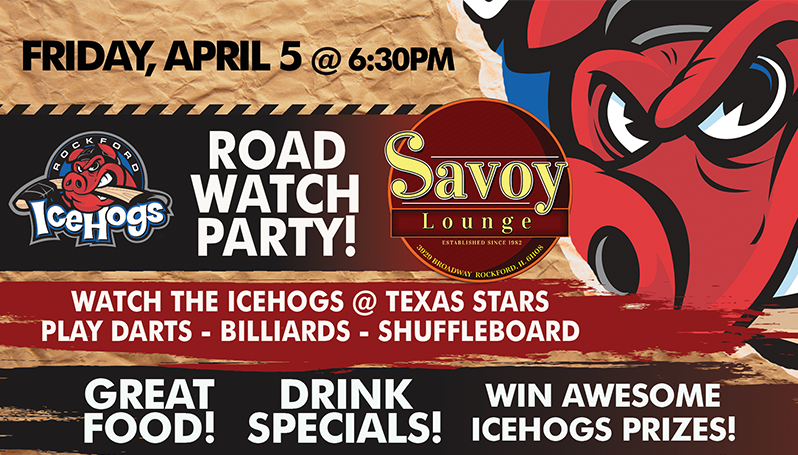 Rockford, Ill. – The Rockford IceHogs are hosting an official Road Watch Party at Savoy Lounge (3929 Broadway #14) for this Friday’s critical divisional game (April 5) at the Texas Stars at 7 p.m. The IceHogs are currently just one point in back of the Stars for the fourth and final playoff berth in the Central Division. Fans are invited to attend Friday’s party for the chance to win several great door prizes while watching live coverage of the IceHogs road game. Prizes at the event include an autographed jersey, several autographed posters and four tickets to both the IceHogs regular season home finale (April 14 vs. Milwaukee) and The Underwater Bubble Show (April 23 at the Coronado Performing Arts Center). Fans can register to win these great prizes in-person at Savoy Lounge beginning at 6:45 p.m. Each prize will be raffled off during Friday’s game against the Stars. For more information on the watch party call the IceHogs front office at (815) 986-6465.